It’s delightfully whimsical. It’s dark and grotesque. It’s a loving homage to retro-animation and French comic books. Its plot couldn’t be simpler in the telling. It’s as radical as “Un Chien Andalou.” So what the hell is Sylvain Chomet’s The Triplets Of Belleville, anyway? All these contradictory statements have been written about the film, yet all of them are perfectly justifiable. Of the five entries in Animation Month, this one is by far the hardest to unpack, because Chomet’s sensibility incorporates so many different impulses at once. Here’s what we know for certain: He’s in love with the shimmering fluidity of ’30s Betty Boop and Popeye cartoons, and the showmanship and music of vaudeville and the Jazz Age. At the same time, he and designer Evgeni Tomov push the old-fashioned designs into a surreal, anarchic realm, with outrageously proportioned characters and spaces that teem with odd bric-a-brac. Though made by passionate historians—of music, of culture, of animation—it isn’t a particularly nostalgic film, nor could it be confused for an ossified tribute to another time. It is, as they say, the darnedest thing. Take the opening sequence, for example. Right off the bat, the film announces its retro leanings with a flashback to the ’30s—complete with fake scratches on the print—that surveys the goings-on at a big vaudeville show. The main attraction are the triplets of Belleville,—slender women dancing and singing into a microphone as if controlled by the strings of a single puppeteer. There’s also a Fred Astaire look-alike doing softshoe (he gets dragged off by the piranha-toothed soles of his own footwear), a Django Reinhardt-type picking a guitar with his toes (he uses his free hand to smoke), and a nimble Josephine Baker-sort with no top and bananas around her. In attendance are gigantic, garishly dressed women with husbands so diminutive that one of them is carried from a limo in the continental divide of his wife’s backside. And, oh yeah, there’s a Godzilla-sized mutant baby onstage, plus a gaggle of men-turned-monkeys for good measure. It’s hard to know what to make of Chomet’s bizarre pastiche of the Jazz Age theater scene: What’s with the mammoth women and tiny men? Or the circus-freak baby? Or the vengeful footwear? But his impressions of the period, from the affectionately obvious to the willfully strange, prove surprisingly harmonious and toe-tapping. As an animator, Chomet isn’t strictly interested in capturing a long-ago era in scrupulous detail—though the film wins any game of “count the references”—but in looking at it through an original lens. “Original” may seem like the wrong word for it, given his stylistic debt to everything from Betty Boop to Looney Tunes to Mr. Magoo to European comics. But they’re all ingredients in a duck soup for which only he has the recipe. The slight letdown of The Triplets Of Belleville is that it doesn’t get any better than those first five minutes—or at least its many brilliant moments are never that sustained. After the whiz-bang opening, the film settles into the weirdly touching relationship between Madame Souza, a pugnacious old woman, and her grandson Champion, an orphaned boy with a sullen disposition. Nothing is explained about their past—indeed, little is explained at all, because the film has virtually no dialogue—but clearly Mme. Souza’s devotion to the boy knows no bounds. Eager to make him happy, she gives Champion a loveable mutt named Bruno, but the kid’s real passion is for bicycles; the only picture he has of his real parents is a joyful shot of dad pedaling mom on the handlebars. When Mme. Souza buys Champion a tricycle, the gift ignites the boy’s passion for biking, and as he gets older, he trains for the professional circuit, with grandma pedaling behind him, encouraging him with a whistle. (This insistent whistle-blowing is Mme. Souza’s primary means of communication, which is just one of the film’s many charms.) During the Tour De France, Champion and two other cyclists are kidnapped by French mobsters and taken across the Atlantic to the city of Belleville, where their collective leg power will be put to use on the black market. Mme. Souza and Bruno follow them to Belleville, where she gets some help in the rescue effort from the now-aged triplets, who are capable of foiling diabolical mob schemes and putting on a great show at the same time. Because Chomet largely forgoes dialogue, his characterization is literally reduced to sketchwork. Bodies are drawn up with vastly exaggerated proportions: The Americans and French adhere to carnival-drawing stereotypes, with the former as lumbering oafs with endlessly elastic waistlines (even the Statue Of Liberty could stand to go on a diet) and the latter as pencil-thin figures with beakish noses and Ichabod Crane necks. The early scenes between Mme. Souza and Champion are sweetened entirely by the determined old woman’s devotion to her grandson, whether that means drifting behind his bike in the pouring rain or massaging out the kinks in his muscular frame with a vacuum cleaner (for his calves), egg beaters (for his legs), and a lawnmower (for his back). And when his wheel frames go crooked, she dutifully aligns the spokes using a model of the Eiffel Tower and a tuning fork. 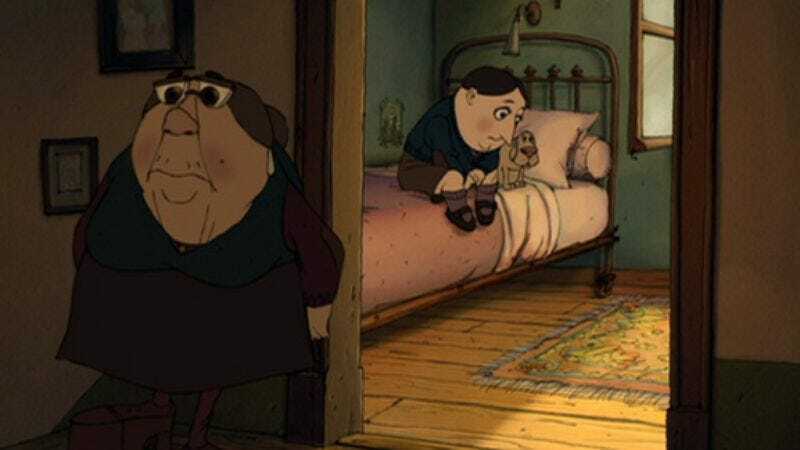 One of the interesting wrinkles in The Triplets Of Belleville—and a good example of Chomet’s willingness to play around with different tones—is that Champion never appears as happy as his grandmother wishes him to be. Aside from his rapture over getting that first tricycle and riding it in joyful circles around the yard, the boy’s melancholy lingers on through adulthood. His participation in the Tour De France should be the thrilling culmination of his hard work and dedication to the sport, but the impression Chomet leaves is of a young man whose entire being has become mechanical. When the gangsters kidnap Champion and force him and two other riders to square off on a Rube Goldberg contraption meant to simulate a race, there’s no change of expression between Champion the Tour De France competitor and this utterly defeated captive forced to perform for gamblers. In light of her grandson’s misery, Mme. Souza’s journey becomes all the more poignant, and it’s her steadfastness that gives this crazy movie its emotional ballast. (Bruno helps too. Extract his scenes from the rest of the movie, and you get a simple, hilarious portrait of the dog mind at work: the can-do eagerness, the unwavering loyalty, the ceaseless barking at passing trains. Bruno even serves as a spare tire when called upon.) She goes through great trials to track him down when he’s kidnapped. She spends her last franc to make a transatlantic voyage in a paddleboat, braves thunderstorms and tidal waves, sleeps under a bridge, and absorbs the humiliation of being penniless and hungry in a city filled with American fatsos. And all this for a young man who doesn’t seem capable of happiness. In the end, though, such nuances in characterization are merely the glue that holds Chomet’s wildly inventive flourishes together. For all its references to other animators and artists, The Triplets Of Belleville is a deeply eccentric, singular piece of work, with ideas and images that have no precedent. Just a few favorite moments: a triplet using a mortar to blow a net-full of frogs out of the water for dinner; an infectious climactic number orchestrated out of non-instruments like a refrigerator rack and a rumpled newspaper; black-and-white dream sequences where the dog imagines himself on the trains he barks at; abducted French cyclists nourished by wine IVs hooked into the arms. Then just when the surreal wackiness starts to feel exhausting and unsustainable, Chomet shifts gears and offers an astonishingly beautiful sequence like the one below, as Mme. Souza crosses the Atlantic to the strains of Mozart’s Mass in C Minor. For a movie so firmly rooted in the past, it’s surprisingly willing to toss the roadmap out the window.